The UCapital investment opportunity offers a safe return starting at a minimum of 8% per year (paid monthly). For those no longer looking to invest in stocks or property this is the ideal opportunity to supplement your income and make your money work harder. Smart Investment for Smart Investors. In a video interview, one of the founding partners Jacques Pretorius, uncovers some of the main questions potential investors have asked. Who are the founders and what is their background? What type of security do I get? What are the essential terms of the loan and what is the interest rate? Can the UCapital investment form part of my self-managed super fund? What is UCapital's core business? Why can I trust UCapital? How do I know I'll get my money back? What is the level of risk investing with UCapital? UCapital is part of one of the most recession-proof industries. Our clients (SME’s) are the most resilient when the economy takes a downturn. Our clients are all over Australia in all types of industries. They would all need to fail at the same time for us to be in trouble. We use a well-seasoned credit model. You have security on the loan book. We have never let an investor down. Why should I invest with UCapital instead of buying property? 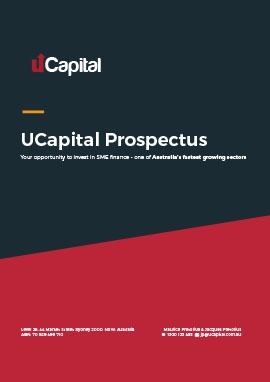 At the moment, The UCapital investment offers a higher return per annum than many properties (all costs considered). Investing in UCapital Is hassle-free in comparison to an investment property. Dealing with tenants, Airbnb etc can be frustrating and time-consuming. Many people don’t have enough money to buy a property, so investing $50-$500K with us is convenient. Many people like the monthly interest payments to supplement their income. Why Should I invest with UCapital instead of buying shares on the stock market? At the moment, the UCapital investment offers a higher return per annum than most stocks or share. There is no volatility investing with UCapital. You know what you are going to get. Many people feel unqualified to trade in the stock market. Our investors love the regular monthly payments we offer to supplement their income. It’s not one vs the other -Shares vs UCapital. Why not try a combination of both? It makes perfect sense to spread your risk and diversify your investment portfolio. What are the basic terms and interest rate? How can I trust UCapital? Why invest with UCapital instead of buying property? Can the UCapital investment form part of my self managed Superfund? Investment exists, without knowing, you’re doing it day-to-day. Your Goal saver account, saving to buy property and super just to name a few. But how much are you earning? Here’s your opportunity to receive a safe return; with up to double a bank’s interest, starting from 8% return on your capital. You’ve worked hard; let us work to gain you a safe return. UCapital is here to help business people with good ideas to develop their businesses. We take a personalized approach to lending, offering short-term alternative business loans of between $5,000 and $250,000. The money can be in your business within days.